Al-Khaafid is the one who brings down tyrants and humiliates the arrogant Pharaohs. He humiliates whomsoever He will among His slaves, lowering him in status and making him unknown and insignificant. And He elevates whomsoever He will among His slaves, raising him in status and position. No one can rise except those whom He raises in status and no one can be humiliated except those whom He lowers in status. And it was said that He raises justice and lowers it. Allah is not unjust, Allah is Just. Everyone on this earth will be accountable for what they have done, everyone. All of these people who are killing and massacring innocent people for their own personal gain who are able to do so because they are high in rank, will be handled by Al-Khafid. Although we forget, Allah remembers all of the lost souls: the Chechens, the Native Americans, the Palestinians, the Iraqis, the Bosnians, the African slaves, the Sudanese, the Jews, the Albanians, the people of Rawanda, the people of Hiroshima and Nagasaki, every soul, Allah sees, hears and knows all things. And no injustice goes unserved. 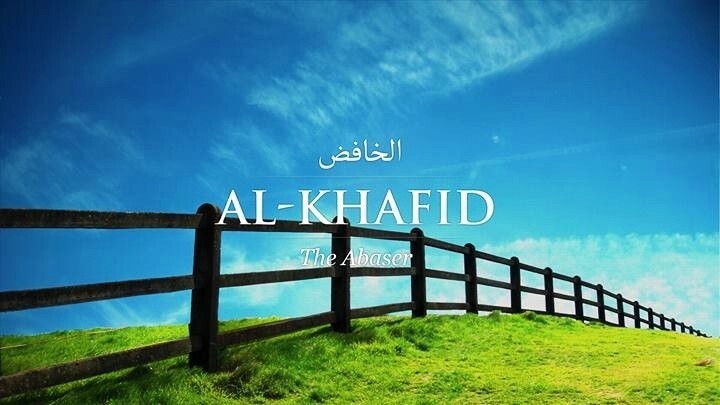 Allaah is al-Khaafid, al-Raafi’ (the Abaser the Exalter). He abases the kuffaar by making their lives miserable and keeping them away from Him, and He raises His close friends by drawing them close to Him and making them happy. He alternates things amongst His slaves, so He humiliates some people and makes them insignificant and takes away their pride, and He raises others by causing them to inherit the authority and land of the former. All of these words are true, and they are included in the meaning of al-Khaafid, al-Raafi’ (the Abaser, the Exalter).